First, the good news: For the eighth year in a row, employers are hiring more college graduates. The bad news? According to a recent survey, many new grads are not measuring up to employers’ expectations. The survey questioned approximately 400 employers and 400 new graduates and found disparities between what employers need and what new grads can offer. One of the biggest problems for employers is the lack of qualified candidates. Plenty of positions remain unfilled in the fields of engineering, business, and computer science because not enough students have majored in those fields, the survey found. The disconnect between employers’ needs and grads’ preparedness goes deeper. Employers are willing to interview candidates who possess just 60 percent of the qualifications for a position. However, one-third of applicants apply to jobs for which they are completely unqualified, according to the survey results. Employers have plenty to say about new grads they meet during interviews, as well. 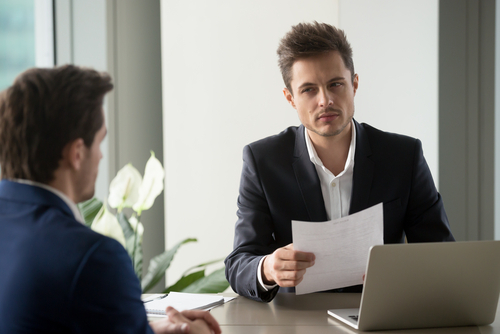 Too many come to an interview without being familiar with the industry or the organization, employers complain, and not enough ask relevant questions about the position. Over half of the candidates employers talk to display negative body language, dress inappropriately, and do not clearly voice their past experiences. Worse, 75 percent of those interviewed never send a thank-you note to indicate their enthusiasm for the position. Interestingly, college grads seem to have an inflated sense of their own worth. The survey’s respondents felt confident in their ability to interview well (90 percent) in direct contrast to what employers experienced. As for salary, the grads expected to earn over $53,000 for their first job; the average salary recruiters offered was $45,000. The jobs are out there. How can students be better prepared to land them? How can you learn about an organization before you interview? What resources are available to study and help you prepare? Why do employers consider prior experience so important? In which ways can you show your communication skills, both written and spoken, at an interview? This entry was posted in 3. News You Can Use and tagged college graduates, job qualifications on September 6, 2017 by bizcombuzz.